Philadelphia’s first Bishop, the Irish-born Franciscan Michael Egan, was appointed a full century after the American colonists began the practice of their Catholic Faith in the New World. The colony of Pennsylvania, chartered in 1681 with William Penn as proprietor, offered the safety of religious tolerance, but 50 years passed before great numbers of Catholics settled in the colony. The English-born Jesuit, Reverend Joseph Greaton, lived in Maryland as early as 1720, and traveled to Philadelphia to offer Mass and administer the sacraments. By 1729, Father Greaton had taken up residence in Philadelphia, discreetly celebrating Mass in private homes. 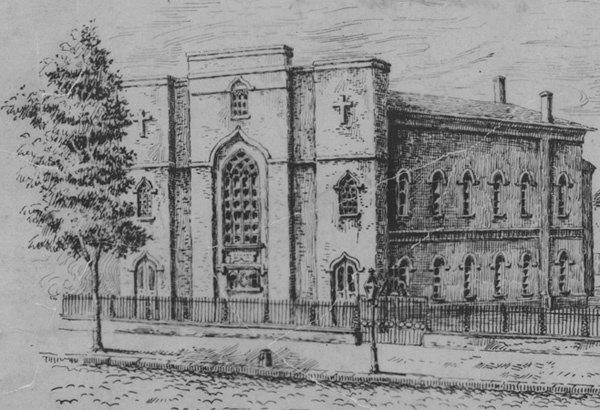 In 1733 he established the first parish in Philadelphia, Saint Joseph’s Church, in a secluded alley near 4th and Walnut Streets. By the eve of the American Revolution, Philadelphia was the largest city in North America. While under the jurisdiction of the Bishop of London, attempts were made to create a diocese with a resident bishop, but colonial priests discouraged this effort. Fearful of re-igniting fierce anti-Catholic sentiment, and concerned about the public duties required of a bishop, American colonial priests declined all offers to establish an episcopate, or to allow a bishop to visit the colonies. The first American diocese was established in Baltimore in 1789, under the leadership of Bishop John Carroll. The boundaries of this singular diocese encompassed the entire United States. Between 1790 and 1820, one-quarter-million immigrants arrived in the United States. 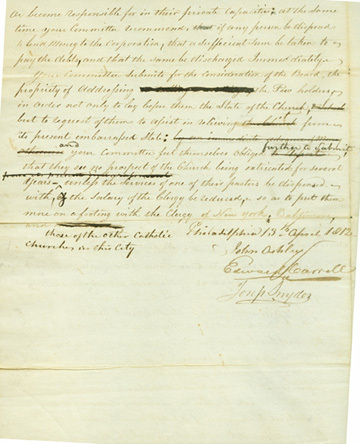 By 1810, the city and county of Philadelphia had over 100,000 inhabitants. 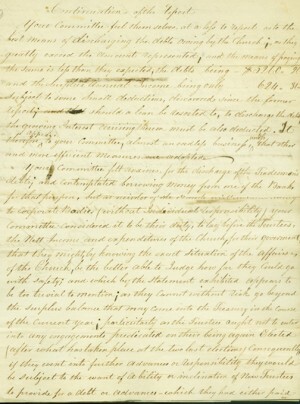 As the number of Catholics in the United States grew, Bishop John Carroll of Baltimore suggested that his immense diocese be divided, and in 1808 the Dioceses of Philadelphia, New York, Boston and Bardstown, Kentucky were established. The newly formed Diocese of Philadelphia encompassed all of Pennsylvania and Delaware, and the southern half of New Jersey. Just two years later, the Diocese of Philadelphia had approximately 11 priests, 16 churches and 30,000 Catholics. Archbishop Carroll nominated Reverend Michael Egan as the first bishop of the newly formed Diocese of Philadelphia. Carroll described Egan in his letter of nomination as “truly pious, learned, religious, remarkable for his great humility, but deficient perhaps, in firmness and without great experience in the direction of affairs.” This description would prove prophetic, as Egan’s episcopate was marred by administrative disputes with lay trustees. Egan was born in 1761 in Limerick, Ireland. As a young man he joined the Order of Friars Minor, and studied at Louvain and Prague, where he was probably ordained. Several members of Bishop Egan’s family came to the United States during his tenure, and settled in Philadelphia. 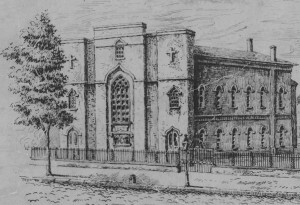 Father Egan’s excellent reputation for preaching greatly appealed to the prestigious congregation of Saint Mary’s in Philadelphia. The lay trustees elected him as one of the pastors in 1803, and Father Egan moved from Lancaster to Philadelphia. After Egan’s appointment as bishop, Saint Mary’s became the diocesan procathedral (an existing parish church used as a cathedral). Engraving of Old St. Mary, n.d.
Michael Egan was named the first bishop of the Diocese of Philadelphia in April 1808, although political conditions in Europe and slow communications from Rome contributed to the delay of his consecration. The ceremony finally took place in Baltimore in St. Peter’s procathedral on October 28, 1810, more than two years after his official appointment. The newly appointed Bishop Egan soon found himself embroiled in disputes with lay trustees, and swayed by the dominant personality of his fellow priest, Reverend William Harold. Bishop Egan suffered ill health for many years, with symptoms suggesting tuberculosis. His poor health was exacerbated by the almost yearly outbreaks of yellow fever in Philadelphia. During these outbreaks, over half the city residents fled to the country, and churches and gathering places were nearly empty. Streets were piled high with coffins awaiting burial, and cries of “bring out your dead” echoed through the city. Bishop Egan’s weakened physical state may have contributed to some of the administrative problems he encountered during his years in Philadelphia. The growing debt at Saint Mary’s prompted the lay trustees to suggest decreasing the number of priests serving the congregation, as well as reducing the salaries of the remaining priests. Egan found himself embroiled in conflicts with a radical faction of forceful lay trustees, who challenged the authority and jurisdiction of priests and bishops. Egan vowed to be more assertive and tried to amicably resolve disputes, but his mild nature restricted his authority. Divisions within the Philadelphia church remained, and tensions grew among the clergy based on issues of trusteeism and the extremely public nature of the conflict. This upheaval in the Philadelphia church persisted even after the death of Philadelphia’s first bishop on July 22, 1814, at age 53. The See remained vacant for the next six years, until Philadelphia’s second bishop, Henry Conwell, was appointed. Bishop Egan was buried in the cemetery adjoining Old Saint Mary’s Church. His remains were moved in 1869, along with those of Bishop Conwell, to the specially constructed crypt for the bishops of Philadelphia beneath the Cathedral of Saints Peter and Paul. Two collections that relate to this topic include St. Mary’s Church (MC-41) and the Bishop Michael Egan Papers (MC-70). Information about Bishop Egan, St. Mary's Church, and the issue of trusteeism can also be found within the Records of the American Catholic Historical Society in PAHRC's collection.